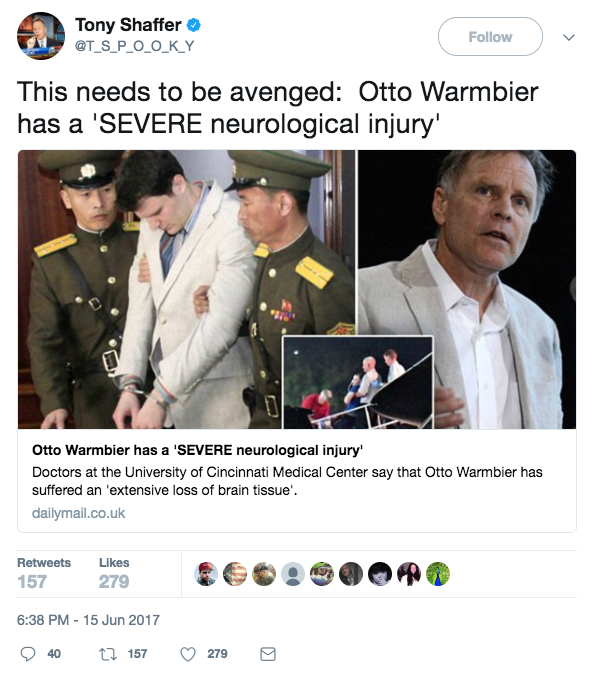 Otto Warmbier, the American college student who had been detained by North Korea and in a coma for 15 of his 17 months there, was likely tortured through repeated use of a drug that used to given to administer lethal injections, according to a retired Army colonel. “He was tortured not so much [by way of] pulling fingernails out with tools but by repeated drugging – sodium pentothal,” Lt. Col. Tony Shaffer told Fox Business on Wednesday. North Korea likely gave Warmbier the drugs repeatedly to try and figure out if he was a spy, Shaffer told Fox. Sodium pentothal used to be the first of the three drugs given during most lethal injections in the U.S.
Warmbier was medically evacuated from North Korea earlier this month, through the efforts of Secretary of State Rex Tillerson and the Trump Administration. He arrived in Cincinnati, Ohio, on June 13. Warmbier was serving a 15-year prison term, with hard labor, in North Korea for alleged anti-state acts, according to reports. Warmbier was in a state of “unresponsive wakefulness” when he arrived home this month. His family said he died on June 19. On June 20, Shaffer tweeted about a statement from former President Barack Obama, who was in office when Warmbier was first detained by North Korea. 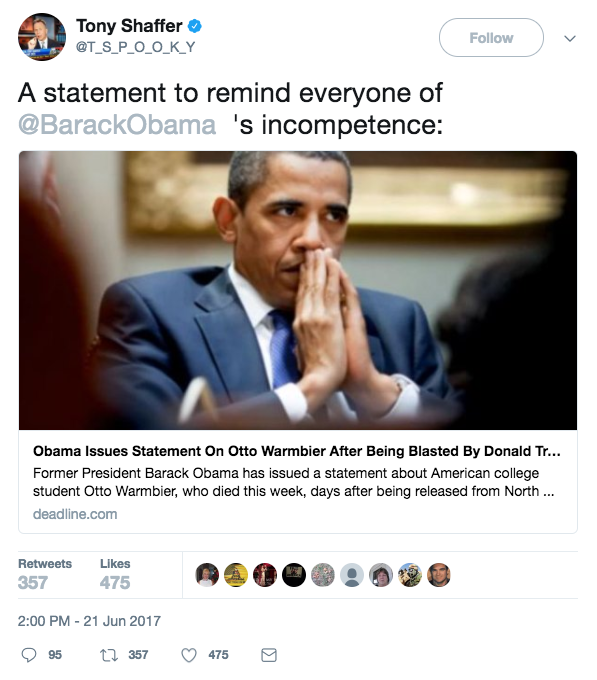 “A statement to remind everyone of [Barack Obama’s] incompetence,” Shaffer tweeted, linking to an article that discusses the statement. “It is painful that Mr. Warmbier was not among them, but our efforts on his behalf never ceased, even in the waning days of the administration,” Price added. Shaffer told Fox there should be “some level of retaliation” from President Donald Trump, about Otto Warmbier’s death.